Sharing my Dashing RMM HUD for my company. Big thanks to the install/initial set up guide. Job failures is for our managed backup (Shadow Protect). Information is gathered via sql queries from labtech. Offline servers and ESET infections are gathered via sql queries from labtech. 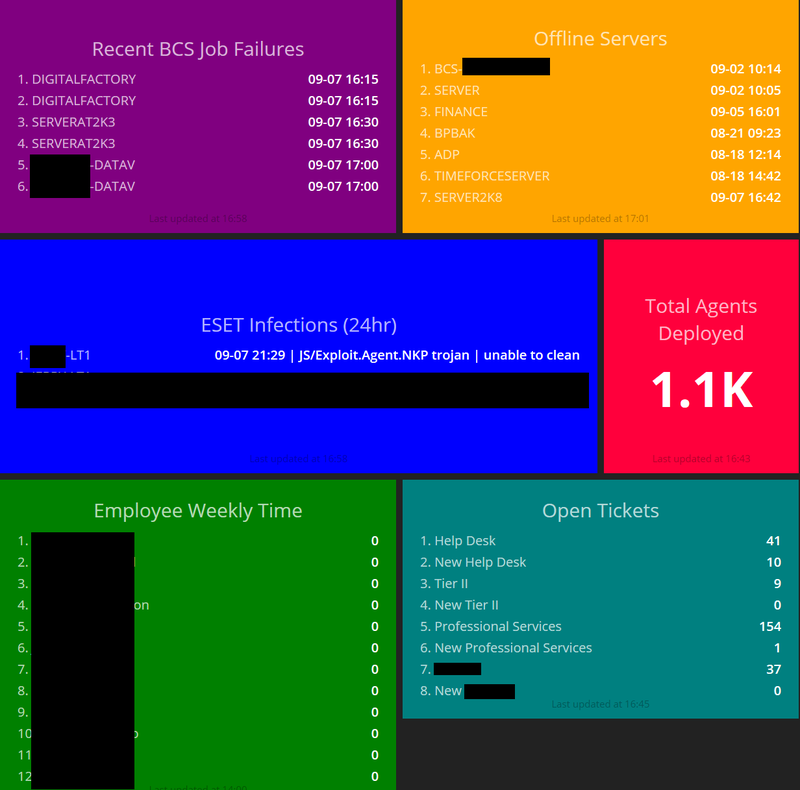 Weekly Time and Open tickets are using Connectwise's API via Powershell. They are also posted to dashing using powershell. I still have a few things I want to add to it. How did you manage that? write your own mySQl query? I'm looking into statistics for ticketing. This looks pretty cool !! Do you mind sharing the code? Thanks in advance ! Here is what my board looks like now. sql = "SELECT name,lastcontact FROM computers WHERE computers.`LastContact` < DATE_ADD(NOW(),INTERVAL - 300 SECOND) AND (computers.os LIKE '%server%')"
sql = "SELECT computer_name,date_occurred,threat,action FROM plugin_eset_ra_threat WHERE plugin_eset_ra_threat.date_occurred > DATE_ADD(NOW(),INTERVAL - 24 HOUR)"
sql = "SELECT name,nextruntime FROM (spjobs JOIN computers ON spjobs.computerid=computers.computerid ) WHERE spjobs.laststatus = 7"
And then use powershell to post the data. Here is one example for the CW employee billable time. This runs on a timer of 300 seconds. $Employees = "Name one","Name two", "Name Three"
Invoke-RestMethod -Uri "http://172.20.11.113:3030/widgets/employeetime" -Method Post -Body $JSONObj -ContentType "application/json"
Looking good! I'm new to this one. Used to use the plugin but i'm working on a seperate ubuntu dash. Would you be able to post some more jobs? I'm still looking for a way to get the Graph, Meter and Number widget to work.